Osmotic and Ionic Regulation in Animals focuses on the processes involved in osmoregulation. The book first discusses general considerations of osmoregulation in animals, including the distinction of body fluids, definitions, and properties of solutions and membranes. The text also looks at the different types of excretory organs, including the differentiation of the excretory organs of mollusks, crustaceans, and vertebrates; protonephridia; and excretion in insects. 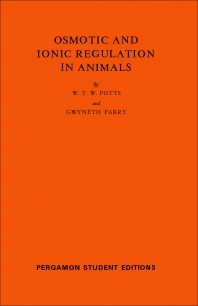 The selection also describes the ionic regulation in marine animals. Topics include the selective advantages of ionic regulation; mechanisms of ionic regulation; and composition of tissues. The text also discusses osmotic regulation in brackish and freshwater animals. The book also focuses on osmotic regulation in terrestrial animals, including salt gain and loss, secretions, water loss and uptake, and osmotic pressure and composition of blood. The text is a good source of information for readers interested in osmoregulation.